* Committed to serving the needs of struggling readers with both in-person and online tutoring services. Judy has spent years developing her highly effective, online Orton-Gillingham (O-G) one-on-one tutoring protocol. It is unlike any other online service. It makes effective, personalized online O-G tutoring a reality - incorporating the multi-sensory, explicit and prescriptive aspects of O-G with fidelity. Judy personally works with your child, virtually, to transform your struggling reader into a successful learner. 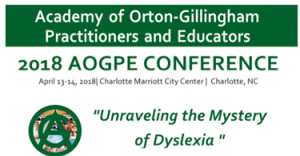 April 13 & 14, 2018 Shaping Readers is excited to be a part of this phenomenal conference! May 12-16, 2018 Judy Packhem will be in RI to administer Diagnostic Reading Assessments for Clients and Prospective Clients.